Two rare birds have been spotted at a County Durham nature reserve for the second year running. Two bitterns have been seen at Rainton Meadows, near Houghton-le-Spring, the headquarters of Durham Wildlife Trust. They are on the Royal Society for the Protection of Birds' (RSPB) red list, making them one of the most threatened in the UK. 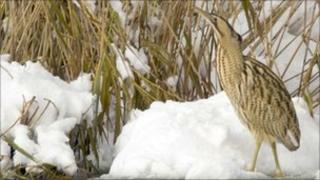 Last winter was the first recorded sighting of a bittern at the site. Trust Reserves Manager Mark Richardson said: "The winter months are often the best time of year to spot this hard-to-see bird. "Their numbers grow in Britain as a result of bitterns trying to escape cold winters on the continent, whilst the snow makes the birds stand out from the reed beds where they hide, and freezing ponds and lakes force the birds to search further afield for food."